A black cleanser for face and body is not something what I would try, I though… Because for daily use it looks a bit difficult to get all the black of your face easy and quick. But someone with much persuasiveness or better a good seller convinced me to buy this black cleanser. But you already feel me coming… because if you read my article about my ultimate beauty favorite from 2017 you already saw this cleanser passed by. So how good is this dark angels from lush? Dark angels is perfect for body and face to use daily. This cleanser contains charcoal powder from there the black color. But it also contains black sugar, avocado-oil, glycerin and much more. So your skin will be cleansed very good but also scrubbed. This cleanser is a bit special because it has a solid structure. But it so simple to use this one! You take a bit from the black cleanser and add a bit water to this. But not too much, and you divide this with massage movement onto your face or body. You can rinse this off with lukewarm water and a facecloth. So that no black spot will stay on your skin. It is more work that a regular cleanser. Buuut this one is for sure worth the extra work! When you find the perfect combination from water with the cleanser it will get a lovely structure. Through the black sugar inside you feel a very light grainy structure. And I love the feeling of that! It scrubs the skin in a mild way. But it is a bit weird to see your black face in the mirror. But the structure feels so good! I’m directly going to tell you the negative thing about this cleanser… And that is that the charcoal powder is hard to wash off. So you need to use a facecloth for sure because otherwise you will see a wearing black shine. But that’s the only negative thing about this because for the rest is the cleanser just amazing! I use this one daily in the morning to clean my face. And it works so good! Thanks to the black sugar my skin also get a little scrub. Since I use this cleanser daily my skin really looks great again! Thanks to dark angels my impurities and pimples are almost gone! So for me is this a wonder product! I only use it for my face but it would also be an amazing cleanser for your body! But if you got a dry or sensitive skin I wound’t recommend this for daily using but surely for a 2 till 3 time treatment during the week! You won’t regret it! Dark angels is also till now my favorite product from lush I ever tried! 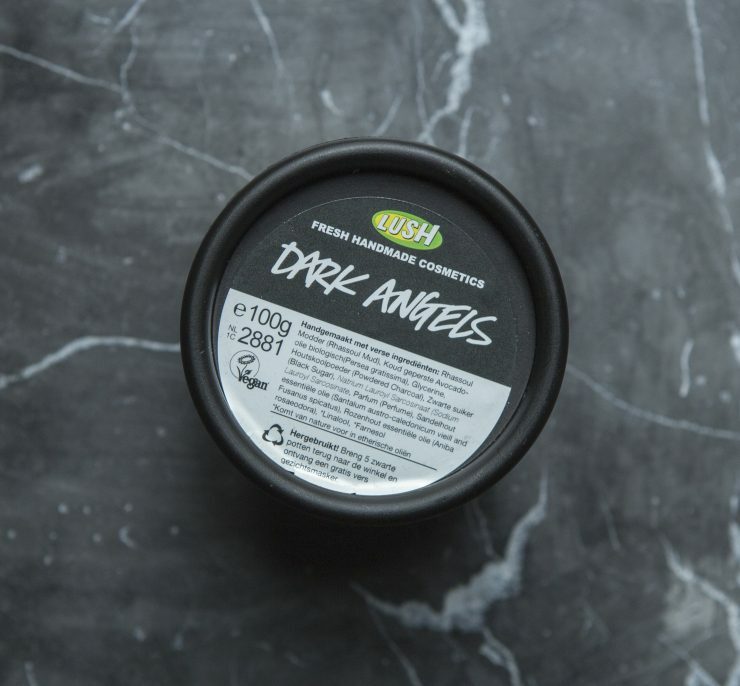 This amazing cleanser from lush, dark angels contains 100g and cost €9,95 and you will do a long time with that! Maar het is inderdaad een top product! Zou je hem niet beter alleen voor savonds kunnen gebruiken? Dan heb je smorgens niet die haast om hem goed af te wassen misschien.. Hij ziet er wel tof uit zo zwart hihi! Omdat het echt voor een oppepper zorgt voor mijn huid gedurende dag. Ik vind deze echt top!